Last week I created a process that polls the usermessagingservice-email adapter to read emails and store the email with attachments as Oracle ACM case documents. 0 An error occurs while processing the XPath expression; the expression is ora:getAttachmentProperty('Content-Type', 'ReceiveMessage_ReceiveNotification_InputVariable','body', '/ns2:message/ns2:attachment[$AttachmentId]'). XPath expression failed to execute. An error occurs while processing the XPath expression; the expression is ora:getAttachmentProperty('Content-Type', 'ReceiveMessage_ReceiveNotification_InputVariable','body', '/ns2:message/ns2:attachment[$AttachmentId]'). Check the detailed root cause described in the exception message text and verify that the XPath query is correct. This occurs with both the functions ora:getAttachmentProperty and ora:getAttachmentContent. Apparently, if the content-type in the properties string does not start with 'multipart', then the attachment is processable. In the Soa Infra database a table exists named 'ATTACHMENTS', with three columns: 'KEY', 'ATTACHMENT' and 'PROPERTIES'. When you do a select on that table where the key the @href attribute, then you'll find the attachment. The PROPERTIES column contains the properties string like mentioned above. So I created a DB Adapter config, with JNDI name 'eis/DB/SOA' (referring to already configured datasource in the DB Adapter), on this table. In the for-each loop I first query the attachment using the href attribute. I only process those attachments that has content-type that is not multipart. Probably a more sophisticated expression can be found.I could check on a list of only supporting mime-types. To me this seems like a bug: SOASuite should be able to get the available properties out of the string to be able to process this.The main problem is also that the BPEL fault-handler is ignored: when the error occurs, the process fails! So I can't catch the exception and act on it. And honestly: I should not query the table myself, using the DB adapter, do I? By the way: working with 12c (12.1.3), but I assume the same will occur in 11g. 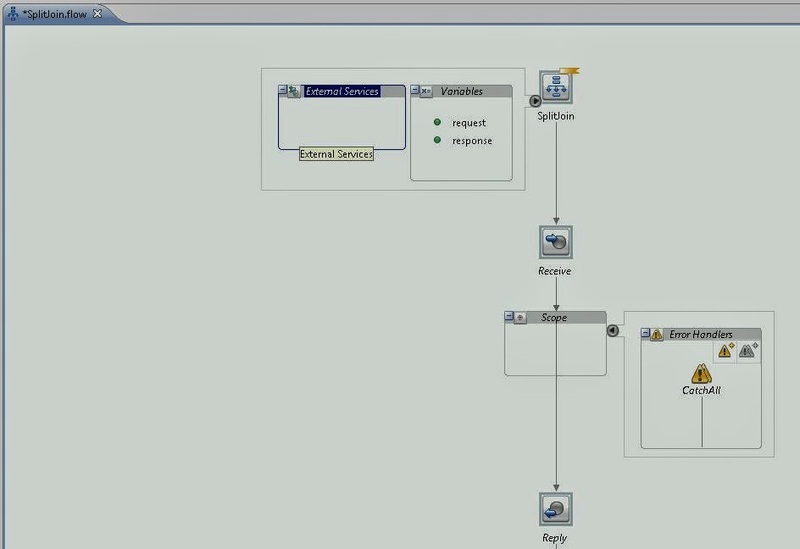 In BPM12c there is a tight integration with BAM, like it was with 11g. However, BAM is not automatically installed in BPM. You need to do that seperately. But having done that, you need to get BPM acquainted with BAM and instruct it to enable process analytics. For a greater part the configuration is similar to the 11g story. My former oracle colleague wrote a blog about it: 'Configuration of BAM and BPM for process analytics'. There is a little difference, because in 12c you won't find the mentioned property 'DisableActions' under the 'oracle.as.soainfra.config' -> 'BPMNConfig'. But you have to enable process analytics on the bpm-server(s). The 12c docs tell you how: '11.1 Understanding Oracle BAM and BPM Integration'. Log in to the Fusion Middleware Control (http:Adminserver-host:port/em) console. In the Target Navigation pane, expand the Weblogic Domain node. 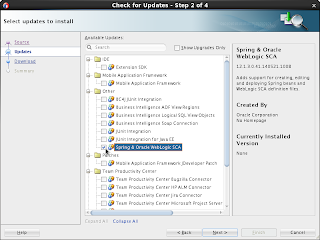 Select the domain in which the Oracle BAM server is installed. Open the MBean Browser by right-clicking on the domain and select System MBean Browser. Expand the Application Defined MBeans node. Navigate to oracle.as.soainfra.config node -> 'Server: server_name' -> AnalyticsConfig -> analytics. Disable the 'DisableProcessMetrics'-property by setting the value to false. You might want to do the same with the 'DisableMonitorExpress'-property. In my current project I need to connect to a DB2 database on an AS400. To do so is no rocket science, but not exactly a NNF (Next-Next-Finish) config. 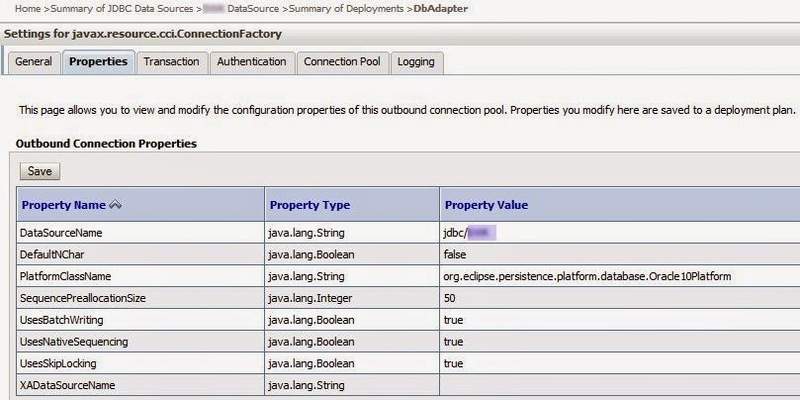 First you need to download the IBM JDBC adapter for DB2, which is open souce. Download the JT400.jar from http://jt400.sourceforge.net/. Place it in a folder on your server. Since it's not an Oracle driver, I don't like to have it placed in the Oracle-Home, so I would put it on a different lib folder, where it is recognisable. Create a logical one, where you place other shared libs as well. 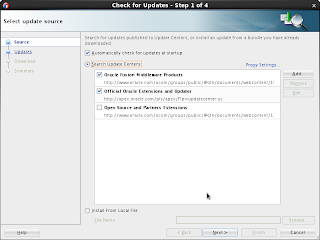 There are several methods to add the lib to your weblogic class path. What worked for me was to add it to the 'setDomainEnv.cmd'/'setDomainEnv.sh' file in the domain home. Since in our case the database apparently has a time out (don't know it this is default behaviour with DB2-AS400), I put in a one-row-query in the Test Table Name-field. And I checked the Test Connections On Reserve -checkbox , because I don't know the time-out frequency. A description of configuring the library and connection in JDeveloper and the DBAdapter can be found in section 9.6.2 of this doc. For DB2 on AS/400, the value should be: 'oracle.tip.adapter.db.toplinkext.DB2AS400Platform', see the docs here. Last week I started with creating a few OSB services for my current project, which is in fact a BPM12c project that needs to be interated with database services on an AS400, thus DB2. Firstly I found that when I tried to deploy on a standalone wls domain (created with the qs_config script), it lacks an OSB installation. Whereas the integrated weblogic default domain has one. I even tried to do an import of a configuration.jar into the sbconsole, but same error here. Frustration all over the place: how hard can it be, beïng quite an experienced osb developer on 11g? Luckily I wasn't the only frustrated chap in the field: Lucas Jellema already ran into it and found a solution, where he credited Daniel Dias from Middleware by Link Consulting. Yesterday, I had an OSB consulting day at a customer. We looked into a REST service that was to be extended with update functionality. Since calling an update service of an EIS (Enterprise Information System) can go wrong with all sorts of errors, it is important to be able to return a fault-message with the errors, JSON format. In this sample case we created a more or less simple xsd for faults (dutch: fouten). To test with different fault messages we simply duplicated the 'fouten' element in the xsd to 'fouten2'. You can assign different HTTP-status codes to the different fault. So this is configuration is pretty simple and straight forward. But it is not quite clear in the documents how you would return a specific fault within your error-handlers in the pipeline. Internally OSB works not only 'XML'-based but actually SOAP-based. So the trick in the end is to replace the body with a soap-fault message and the selection of the REST/JSON errormessage is done based on the structure of the document in the details-section of the SOAP-Fault. In the screen above, you would define for each fault message an xsd-element and apparently it validates the soap-fault-details content against each XSD defined, and the xsd against which the detail-content is valid points to the returned fault, with the corresponding HTTP Status. Of course the actual fault detail must follow the xsd for that particular fault. We tested but the faultcode or fault string does not have any affect in selection of the REST-fault or HTTP statuscode. With the xquery above we got the 'fault' returned as defined in the REST definition, as shown in the screendump above. In our example, if we would changed the contents of this xquery and replace the tag <ns2:fouten> to <ns2:fouten2> then we got the other fault (fault2), with the corresponding HTTP-status. A detail with contents that does not correspond to any of the defined fault-xsd's would result in HTTP-status 500: internal server error. So it is important to have a proper transformation where the returning fault-detail is valid to at least one of the fault-xsd's. Another conclusion is that since the fault selection is apparently based on the detail-contents against the registered fault-xsd-elements, you apperently can't have different faults with the same xsd. Since JSON is 'namespace-less', you probably can solve this by defining several copies of the same xsd with a different namespace, one for each fault. The choosen namespace in the xquery would then be the selector for the fault. But since the underlying element names are the same, it would not differ in the resulting JSON-message. Of course in an XML result it would differ. When you want to do demo-ing or perform the BPM12c workshops on a BPM12c QuickStart developers installation you'll need the Oracle BPM Demo User community. You know: with Charles Dickens, John Steinbeck and friends. How to do so, you can find on the page following this link. You'll need the demo-community scripting that can be found following this link, and then download 'workflow-001-DemoCommunitySeedApp'. 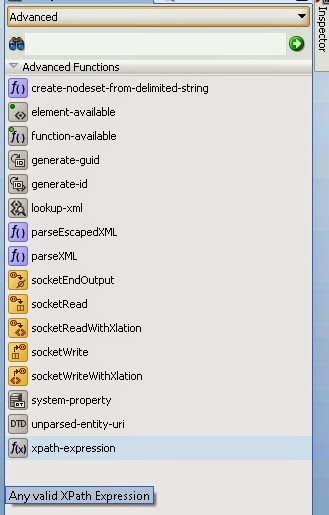 However, besides adapting the build.properties file, there are a few changes to make in the build.xml. This is because the script lacks a definition for the ant-contrib lib, needed amongst others for the 'if' activities. After this change, it worked for me. Lately I needed to transfer messages from OSB to BPM Suite. The setup was that OSB calls a Webservice implemented by a Mediator component that publishes the message on a JMS queue. The webservice request contains a mesage header and a message payload. The payload published as the JMS message-content, but the message header elements were added as custom JMS-properties to the message. How to do that is quite easy and described for instance in this blog. The JMS Adapter forJMS documentation can be found here, and the particular part about the properties here. The property name is of the same structure as with the mediator: 'jca.jms.JMSProperty.name'. The expression must denote an automatically instantiated dataobject of type string. I tried to use a structured business object, but then apparently only the root element is instantiated. 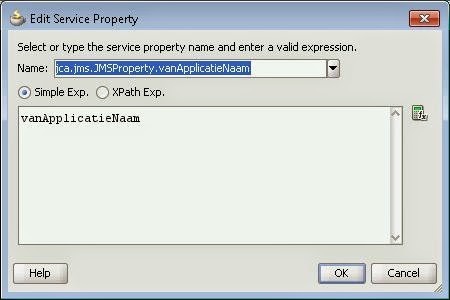 On run-time I got errors that the assignment of the JMS-property to the particular element failed. So for each JMS-Property I created a separate Dataobject of type string. And that works perfectly. I ran into this earlier, but today it happened to me again, so apparently a blog would be a good idea. I use quite some Xslt's in my OSB Project. Merely because I'm more used to XSLT than in XQuery, but also because I've the feeling that it is better suitable in tranforming big XSD. And I found a few minor problems with some XSD's in the XQuery mapper of OEPE. Anyway, in an XSLT there is a special attribute "exclude-result-prefixes" that allows you to name all the namespace-prefixes that you declare for referencing functions that should be excluded from the resulting xml. [MyPipelinePair, Response Pipeline, MyOperation-TransformResponse, Replace action] XQuery expression validation failed: com.bea.wli.sb.resources.ResourceException: An error occurred creating the XSLT executor: javax.xml.transform.TransformerException: java.lang.IllegalStateException: The XSLT resource "XSLT MyService/CBS/V1/xslt/MyXSLT" is not in a valid state..
javax.xml.transform.TransformerException: org.xml.sax.SAXParseException; lineNumber: 19; columnNumber: 69; Element type "xsl:variable" must be followed by either attribute specifications, ">" or "/>". Reading this error, what do you think was wrong with my XSLT? At first I indeed checked my variable declarations, but I did not touch those. It appeared however that publisher in OEPE has a limitation in the attribute-length for this attribute.It's one of those errors that does not say what it means at all. I use the JDeveloper XSLT-mapper, and if you create a new XSLT with it, by default you're provided with several namespace-declarations for xpath-extensions functions for bpel, bpm/bpmn, humanworkflow, ldap, mediator, etc. Most of them you won't use, especially in an OSB project, since (in 11g that is) those functions are not supported by OSB. So you can remove all the unnecessary namespace declarations from the header, making them obsolete for the "exclude-result-prefixes"-attribute. This makes not only the XSLT-header shorter, but it allows you to cleanup the "exclude-result-prefixes" as well. When the "exclude-result-prefixes"-attribute is shortened enough, the xslt is publishable again. Then OEPE asks for a binding/operation in a wsdl in your project. The resulting component has an extension that a little better suggests the specifics of the component: '.flow'. I'm not going to give a BPEL-small-course here. If you google on 'OSB SplitJoin Examples' you'll get several examples of SplitJoin constructions. I will make several remarks here. Firstly, given the names and constructions, apparently the supported BPEL version is BPEL 2.0. Secondly, you would think that you could inter-exchange bpel processes from SOASuite-BPEL. However if you implement several Assign Operations, you'll see that the different operations on the messages/variables are done in BEA-extensions. 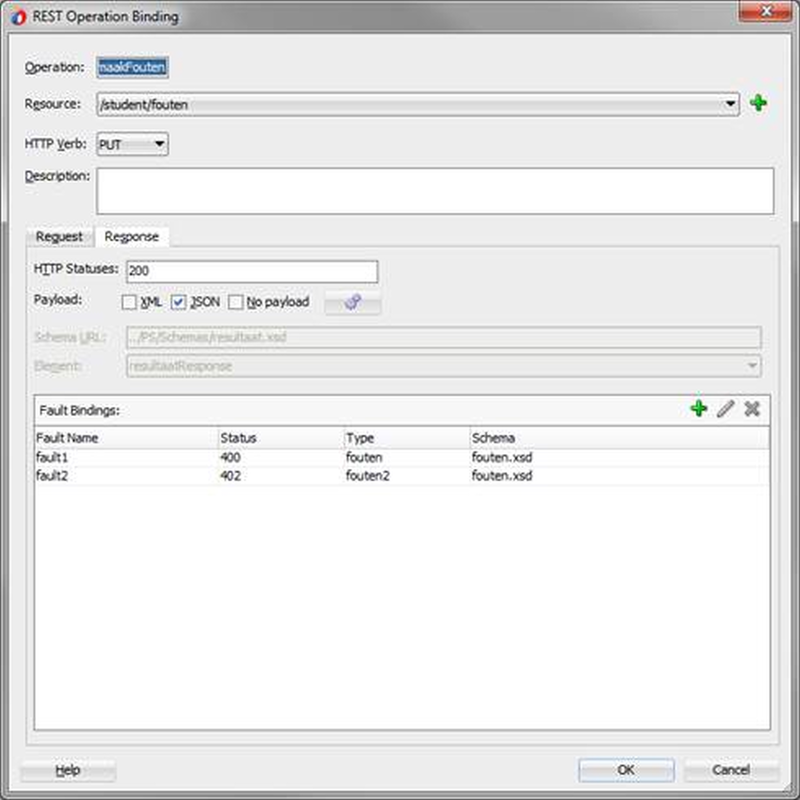 The Log operation is also a BEA-extension to the BPEL-Assign construct. Furthermore, I found that you can't introspect into the xml-structure of the messages in the expression builders of the assign operations. Like I'm used to in JDeveloper BPEL Designer, or even in the OEPE ProxyService 'MessageFlow'-modeller. This is very inconvenient, because you'll have to edit the xpath-expressions by hand. And I found by trial and error that you couldn't refer to the root-element of the element. If you log a variable, you'll see the root-element. But apparently you'll have to refer to the sub-elements relatively from the variable. like: '$ServiceReply.part1//ns1:subElement'. Although you can model a complete BPEL process in the SplitJoin, I would be reluctant to use it excessively in OSB. 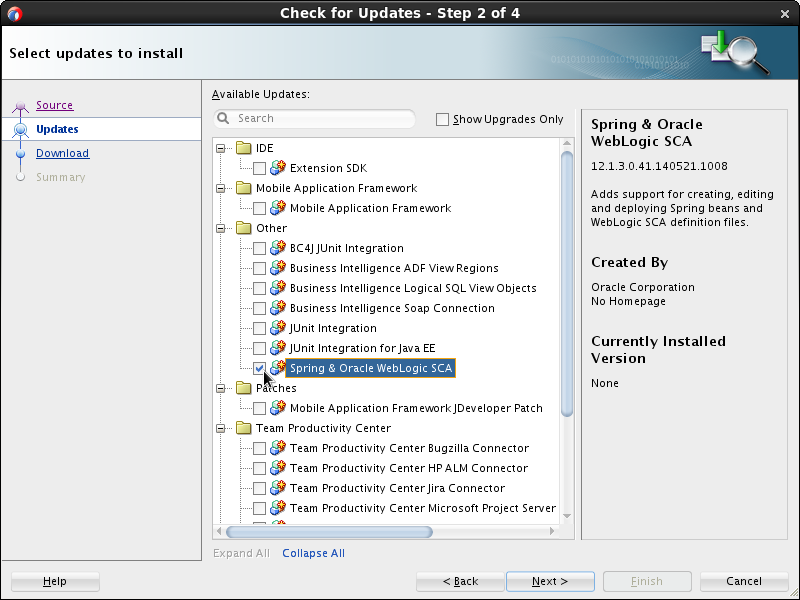 For a complex BPEL process I would use Oracle SOASuite. Not only because the Jdeveloper BPEL Designer is more convenient, the support of the Runtime Engine in EnterpriseManager is much better. In OSB you can't introspect into a running/completed instance as you can in EM. Lastly, you can't call a SplitJoin/BPEL-flow directly from your ProxyService. You'll need to generate a BusinessService on it. 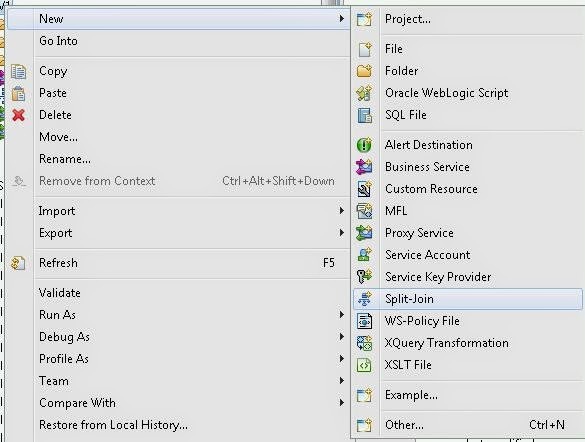 This is actually quite simple: just right click on the SplitJoin -> Oracle Service Bus -> Generate Business Service. In my case I created a simple wsdl specially for the SplitJoin solution. This one is then called from my proxy-service only for the parallelism part. 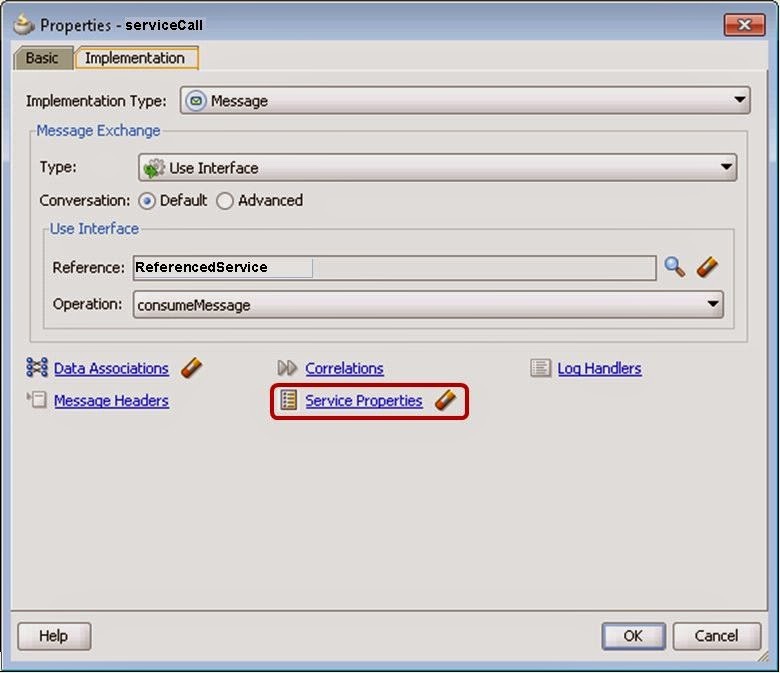 The request and response messages are based on a separate xsd with the different request and response elements combined. In the ProxyService I already created functionality to aggregate and transform the response-parts to a combined response. The splitJoin is a nice component. But it's unclear to me why a seperate engine is added just to be able to do parallism. And the designer could be improved. But better still: leave it over to the SOASuite BPEL designer and engine. For me personally I'm not sure to what extend I should use this..
At a recent customer I got the assignment to implement a SAML 2.0 configuration. The customer is in this setup a Service Provider. They provide a student-administration application for the Dutch Higher Education Sector, like Colleges and Universities. The application conventionally is implemented on premise. But they like to move to a SaaS model. One institute is going to use the application from 'the cloud'. In the Dutch education sector, an organization called SurfConext serves as an authentication broker. When a user connects to the application, Weblogic finds that the user is not authenticated: it lacks a SAML2.0 token (2). So when configured correctly the browser is rerouted to SurfConext (3). On an authentication request SurfConext displays a so-called ‘Where Are You From’ (WAYF) page, on which a user can choose the institute to which he or she is connected. 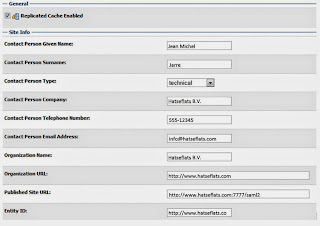 SurfConext then provides a means to enter the username and password (4). On submit SurfConext validates the credentials against the actual IdP, which is provided by the user’s institute (5). 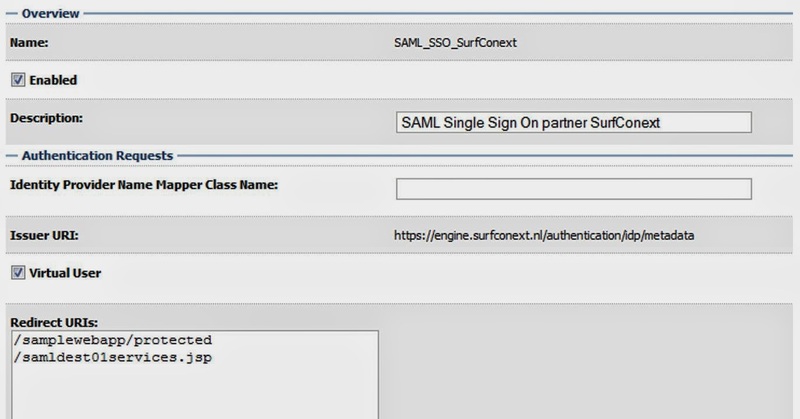 On a valid authentication, SurfConext provides a SAML2.0 token identifying the user with possible assertions (6). The page is refreshed and redirected to the landing page of the application (7). For Weblogic SurfConext is in fact the Identity Profider, although in fact, based on the choice on the WAYF page, it reroutes the authentication request to the IdP of the particular institute. Unfortunately I did not find a how-to of that particular setup in the docs. Although I found this. But I did find the following blog: https://blogs.oracle.com/blogbypuneeth/entry/steps_to_configure_saml_2, that helped me much. Basically the setup is only the service provider part of that description. To be able to test the setup against a test-IdP of SurfConext the configured Weblogic need to be reachable from internet. 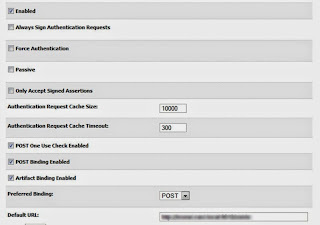 Appropriate firewall and proxy-server configuration need to be done upfront to enable both SurfConext to connect to the Weblogic Server as well as a remote user. All configuration regarding url’s need to be done using the outside url’s configured above. A PC with a direct internet connection that is enabled to connect through these same URL’s is needed to test the configuration. When connecting a pc to the intranet of the customer enables the pc to connect to internet, but the internal network configuration prevented connecting to the weblogic server using the remote url’s. During the configuration a so called SAML Metadata file is created. This file is requested by SurfConext to get acquainted with the Service Provider. This configuration can change through reconfigurations. So SurfConext requests this through a HTTPS url. This url need to be configured, and also remotely connectable. An option is the htdocs folder of a webserver that is connectable through https. In other SAML2 setups you might need to upload the metadata-file to the identity provider's server. 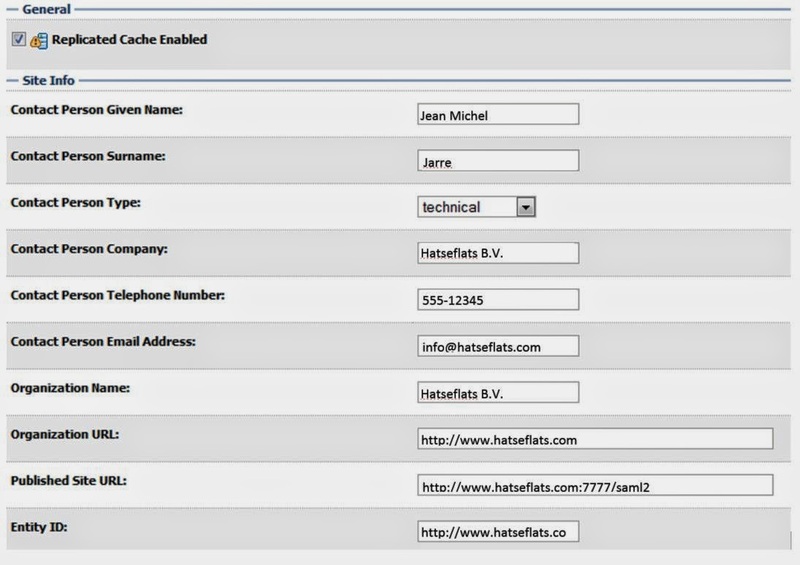 You also need the SAML metadata of SurfConext. 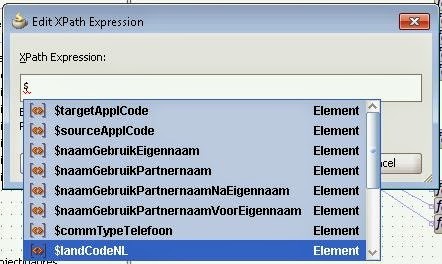 It can be downloaded from: https://wiki.surfnet.nl/display/surfconextdev/Connection+metadata. 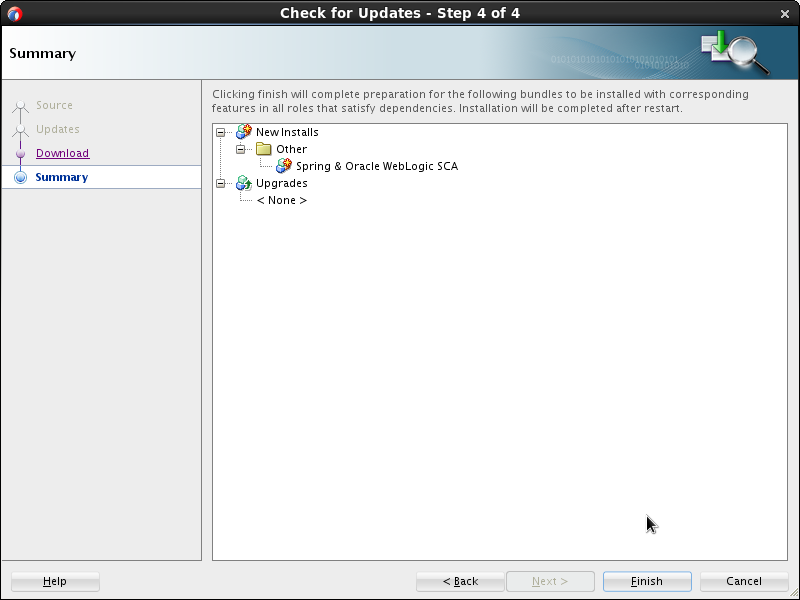 Repackage and redeploy the application to weblogic. Here we start with the first steps to configure Weblogic: create a SAML2IdentityAsserter on the Service Provider domain. Click Ok, Save and activate changes if you're in a production domain (I'm not going to repeat that every time again in the rest of this blog). In this part the managed server(s) serving the application need to be configured for the so called 'federated services'. It need to know how to behave as a SAML2.0 Service Provider. This URL should be accessible from outside the organization, that is from SurfConext. Contact Person Type Choose one from the list, like 'technical'. Organization Name Eg. Hatseflats B.V. This URL should be accessible from outside the organization, that is from SurfConext. The Identity Provider needs to be able to connect to it. SurfConext expect an URI with at least a colon (‘:’), usually the URL of the SP. 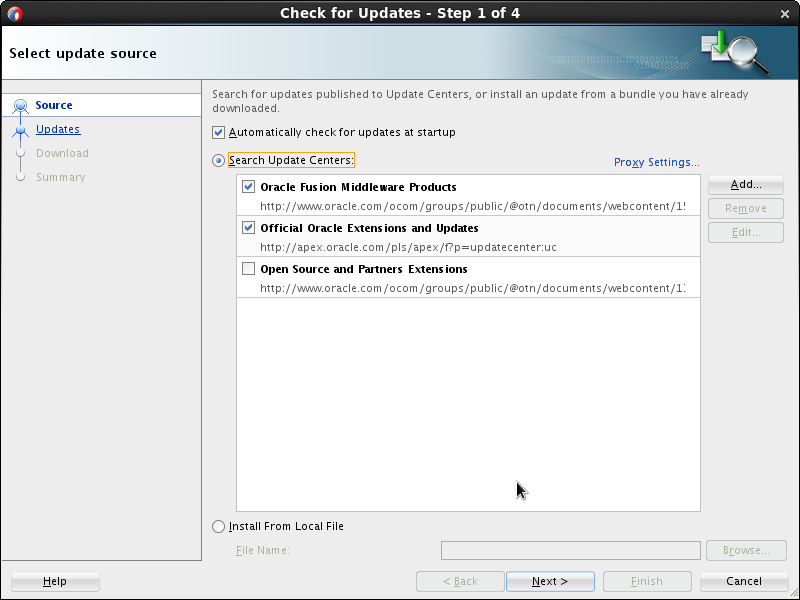 When checked Weblogic will check the responding Url to the URL in the original request. This could result in a ‘403 Forbidden’ message. If signing is used the alias of the proper private certificate in the keystore that is configured in WLS is to be provided. 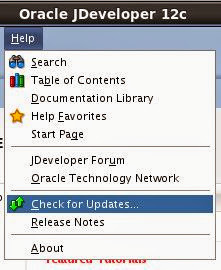 Provide a valid path, like /home/oracle/Documents/... and click 'OK'. Copy this to a location on a http-server that is remotely connectable through HTTPS and provide the url to SurfConext. 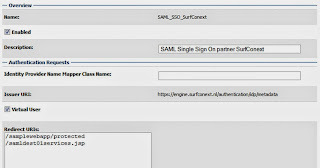 Add new “Web Single Sign-On Identity Provider Partner” named for instance "SAML_SSO_SurfConext". These are URI’s relative to the root of the server. In this section an Authentication provider is added. Add a new Authentication Provider. Name it: ‘SurfConextAuthenticator’ and select as type: 'SAMLAuthenticator'. Return to the authentication providers and click on 'Reorder'. 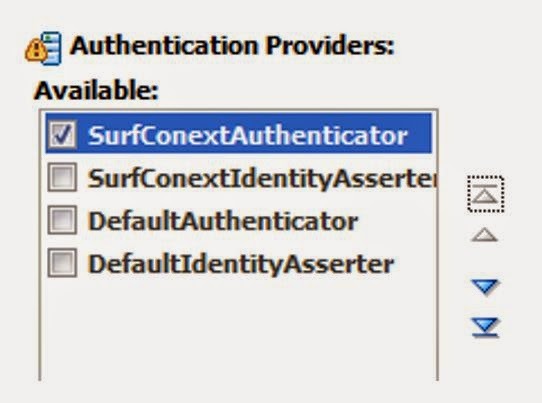 The SurfConext authenticator and Identity Asserter should be first in the sequence. The control flag of the Default Authenticator is by default set to ‘REQUIRED’. That means that for an authentication request this one needs to be executed. However, for the application we want the SAMLAuthentication be Sufficient, thus that the other authenticators need not to be executed. So set these other ones (if others including the DefaultAuthenticator exist) to ‘SUFFICIENT’ as well. Expand the nodes ‘weblogic -> security’. Check the node ‘Saml2’ and click 'Enable'. 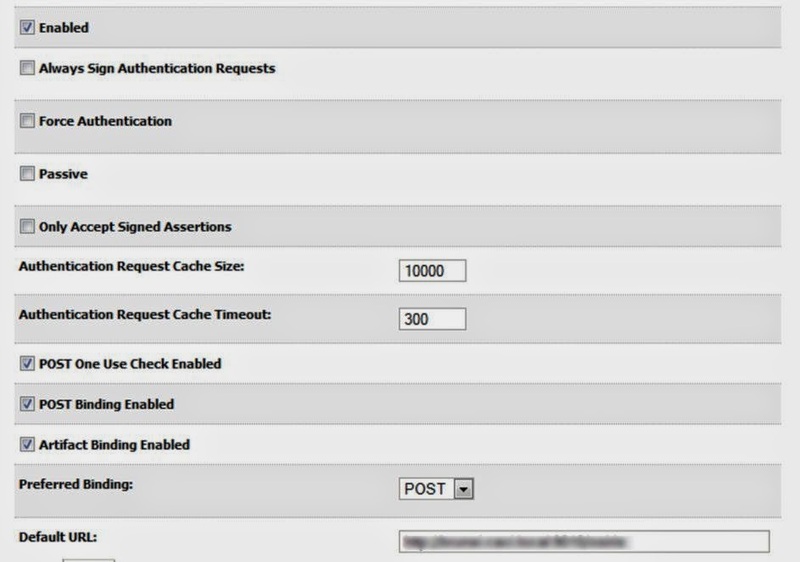 This will add SAML2 related logging during authentication processes to the server.log. To disable the logging, check the node or higher level nodes and click 'Disable'. // getNames gets a list of ContextElement names that can be requested. // If the Attribute is "loginAccount"
Package the classes as a java archive (jar) and place it in a folder on the weblogic server. For instance $DOMAIN_HOME/lib. Although the $DOMAIN_HOME/lib is in the classpath for many usages, for this usage the jar file is not picked-up by the class-loaders. Probably due to the class-loader hierarchy. To have the jar-file (SurfConextSamlIdentityMapper.jar) in the system class path, add the complete path to the jar file to the classpath on the Startup-tab on both the AdminServer as well as the Managed server. In this the AdminServer is needed, since class is configured through the Realm, and during the configuration the existence of the class is checked. Apparently it is required to also add the weblogic.jar before the SurfConextSamlIdentityMapper.jar to the startup-classpath. Then restart the AdminServer as well as the managed servers. Edit the created SSO Identity Provider Partner “SAML_SSO_SurfConext”. Connect as ‘student1’ with password ‘student1’ (or one of the other test creditials like student2, student3, see https://wiki.surfnet.nl/display/surfconextdev/Test+and+Guest+Identity+Providers). After a succesfull logon, the browser should be redirected to the application. The choosen credential should of course be known as a userid in the application. This is one of the bigger stories on this blog. I actually edited the configuration document as a blog entry. I hope you'll find it usefull. With this blog you have a complete how-to for the ServiceProvider part for an ServiceProvider Initiated SSO setup. SAML2 seemed complicated to me at first. And under the covers it still might be. But it turns out that Weblogic11g has a great implementation for it, that is neatly configurable. It's a little pity that you need a mapper class for the identity-mapping. It would be nice if you could configure the attribute-value to be returned as a userid. But the mapper class is not that complicated. Of course you know already that in Jdeveloper you can create xsl maps, just by drawing lines between source and target elements. In many cases you need functions or complex expressions in between. Those are "drag-and-dropable" as well. I found that you can even drop a function on a line and the function will be added to the expression. So with a little thought of the sequence of "drag-and-drops" of functions you can assemble pretty complex expressions together just by using the mouse. Although I'm not affraid to hack back in the source code of the xsl for quickness, I found that this allowed me to spare a few switches between the Design and the Source tab. That is convenient, since hacking the source and switching back to the Design tab will cause the Designer to initialize again, driving you to expand again all the nodes you were working on. Understandable, but inconvenient with large XSD's. At the bottom you find a xpath-expression element. Drag-and-drop that in the design area and connect it to the target element. When you edit it you can just type in your expression, for instance just a variable. When you start with a dollar sign, it even gives you a drop-down-list with available variables. Just pick the right one and our done. I admit, no high-standard tip, but convenient enough though, for me at least. In my current project I need to query an MS SqlServer database. Unfortunately the dates are stored as a BigInt instead of a proper date datatype. So I had to find out how to do compare the dates with the systemdate, and how to get the system date. To log this for possible later use, as an exception, a blog about SqlServer. As you can see you reference the TestCase property by prefixing it with #TestCase. This refers to the current, running TestCase. For the sharp readers: my property reference in the assert is lower-init-case, where in the groovy script and the message it has an initial capital. I found though that the property is apparently not case-sensitive. A few weeks ago I reported about my experiences with JDeveloper 11g PS6 in Malta. I had to borrow a laptop to do the Adaptive Case Management workshop. It was a HP laptop with Ubuntu 12. Somehow this combination with VirtualBox 4.3.6 lead into a bug in JDeveloper. Creating a new project would introduce a dash ('-') in the ID of each created activity. In the mean time I have a new laptop, a very nice Asus N56. This morning I was in the opportunity to startup the VM that I exported and backed up from the borrowed laptop. And what a surprise: creating a new project just works! No naming conflicts. 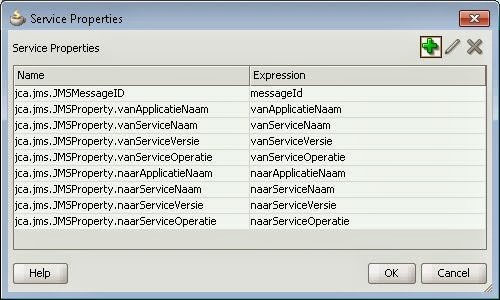 Also, of course, creating a new activity is ok.
Years ago I wrote an article (in Dutch) on the XML functions in Oracle SQL. It can be found here. It describes how to create an xml document as an XMLType with an Oracle SQL Query. The query that is described is based on a pretty simple table, with no relationships. I'm creating a new course based on a datamodel we created years ago, that contains data. I wanted to abstract some of that data as xml, but then: how about the foreign key relations? It turns out pretty straightforward, that you can probably figure out yourself. But hey, I'm not a bad guy, so how about sharing it to you? , xmlattributes( 'http://xmlnls.darwin-it.nl/doe/xsd/v1/employee' as "xmlns"
, ( select xmlelement( "emp:addresses"
, xmlattributes( ate.code as "type"